Now you can ride your bike to the Iroquois! 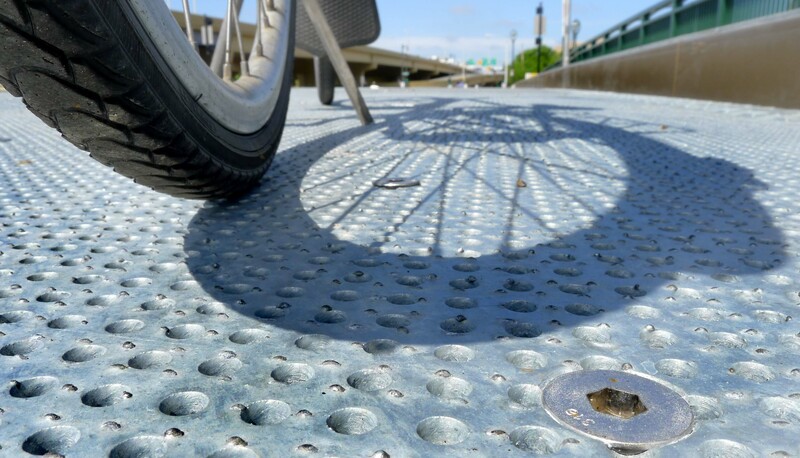 Yesterday, with no fanfare, the Milwaukee Department of Public Works re-opened the Clybourn Street lift bridge, which now includes bicycle-friendly plates on the north side of the open metal grate deck. People no longer need fear riding across the once slippery metal decking on this important one-way connection west to the 6th Street Bridge and the Hank Aaron State Trail. Unfortunately, the rest of Clybourn did not get bike lanes when it was recently reconstructed as part of the Marquette Interchange project, but I ride it frequently on my way home and do not find it too unpleasant. The Bridge had been closed since last July 26th for rehabilitation, which included replacement of structural steel components, decking, walkways and railings; replacement of mechanical lifting components (weights, cables, hydraulic lines, etc); upgrade of operating systems; repairs of concrete piers; sandblasting and painting, and associated approach work and street paving. It is our policy that whenever we redeck or rehabilitate one of the 21 lift bridges in Milwaukee, we add bicycle plates. The plates are perforated to reduce weight and improve drainage. You can see they have a rough coating and little nubs to ensure they are not slippery when wet. We tried something new with this bridge. We left a gap between the bicycle plate and the curb face to help reduce snow drift building up when the sidewalks are cleared in the winter. This should also help reduce plow drift when the street is plowed. That has been a chronic problem on other lift bridges because our sidewalks get cleared after the streets, so the plows and snow blowers through the sidewalk snow onto the plates, making them useless. I thought this might help and since you can’t ride safely in that last foot next to the curb face, the gap should not be a problem during the rest of the year. This gap between the plates and the curb was included in the design to reduce snow build-up in the winter. 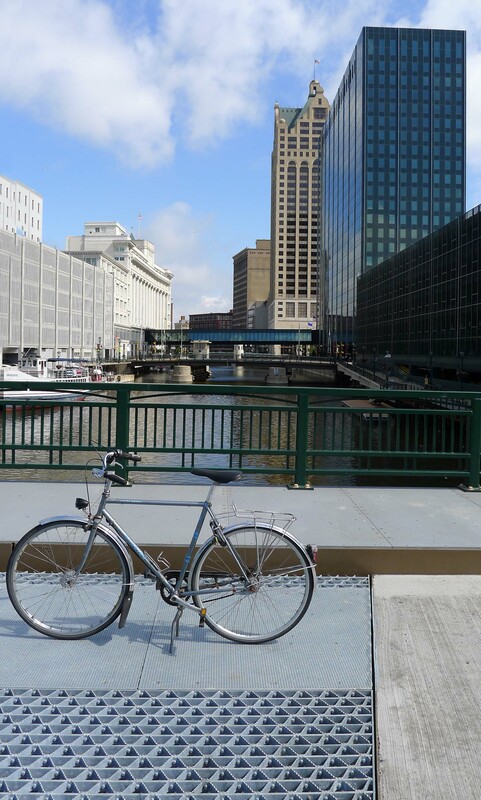 Of the 21 various lift bridges in Milwaukee, we have added similar bike plates to all the bridges we have worked on in the last 8 years or so: Kilbourn, State, both 6th Street Bridges, Highland (has a concrete deck), and McKinely. Cherry recently redone but was a smaller maintenance job without the budget for the special plates. It only got new open metal grate decking that is much better than the old slippery smooth square grate decking it had, but in the next year we plan to retrofit plates to Cherry, Water and Wells with a special grant. More bridges will become bicycle friendly late this year or early next when the Milwaukee DPW begins rehabing the bascule bridges on Wisconsin and Juneau, so those will become bicycle friendly. Lastly, we will be retrofitting plates to the open metal grate decks of the bascule bridge on S 1st (just north of Becher) as well as the Young Street (Broadway) Bridge. While we don’t want to blow our own horn every time we do our job, sometimes when it seems like nothing is happening, it helps to celebrate these small improvments for area cylcists. One project at a time, little by little, it is becoming easier and more pleasant to get around Milwaukee by bike. Every little bit helps build the network! Great work Dave. Are there any plans for the bridge on S. 2nd St? Since the reconstruction of S 2nd st. I (along with a growing number of others) have been using that route. I took a pretty good spill on that bridge on an icy day earlier this spring. That certainly makes sense Casey. I will talk to structures about it, and perhaps even discuss switching the plates on Cherry to S 2nd given the complete streets road diet projects are done. With the time it takes to apply for grants and process project paperwork, S 2nd was not on the radar when we applied for the grants to add bike lanes. This is great work and much appreciated! Thanks for the wonderful work and appreciated! I can’t wait to try them in winter! Going from tour de fat to summerfest last year I watched a guy try to cross the KK Ave bridge on a skateboard! That didn’t go so well. 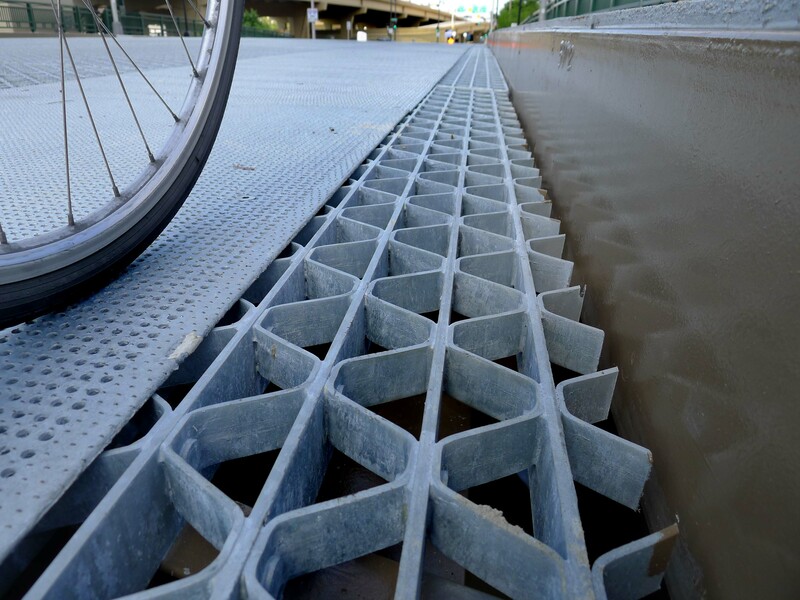 Any idea where we can direct a city interested in buying/installing some of these bicycle friendly bridge plates? Do you have any costs or spec’s? Otherwise, you could direct any engineers to the Structural Engineering Dept. at Milwaukee DPW. Milwaukee’s Chief Structural Engineer is Craig Liberto.